Our elegant LED Frosted Glass Reading Light is an economic option for your interior camper trailer, caravan, marine or yacht applications. It is portable for your travel convenience with it's lightweight and shock-resistant characteristics. With a classy frosted durable, strong glass lampshade and 3 high quality LEDs, it emits an even and soft light for your reading requirements which won't cause eye strain or headaches. 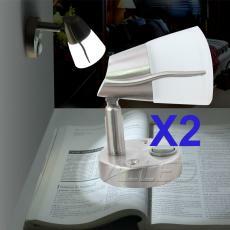 By using this reading light, you will be able to enjoy your reading and hobbies for a long time. Reading can once again be a great pleasure. Not all reading lights create the best light to suit your reading and hobby requirements. Why not get a good light as a gift? And reading is ones again a pleasure. Standard incandescent reading light globes often add to your hassle. Our LED Reading Light is able to help you realize your dream of one light one life. The savings on your electricity costs by switching to LED will add up over time. Why the comment about heat dissipation? If its LED there shouldn't be any to worry about should there? The description to say about heat dissipation, that is to tell customers about LED is a cool lighting source, and generate little heat when producing light. So when reading under this light, you won’t have to be confused by heat and the high working temperature of a reading light.